When I concluded my New Years article survey for 2019, an overwhelming 42.9% of you asked for a sabbat-related craft. Thanks to your immense response, I'll be providing a sabbat-related craft for each holiday this year! Because February Eve is all about life budding under the snow and ice, the first signs of spring, and the return of the light, I turned to ice lanterns. I felt these perfectly exemplified the symbolism of Imbolc with the added bonus of creating an offering to the earth once they finally melt! A large, tall cylindrical container, like a plastic dish or pitcher. A smaller, tall cylindrical container, like a smaller plastic dish or glass jar. Various fruits, herbs, veggies, twigs, vines, evergreens or flowers that you feel represent the holiday. Heavy tape, preferably with an adhesive that can put up with heavy glass and water. Scissors to cut said tape, twigs, vines, flowers, etc. 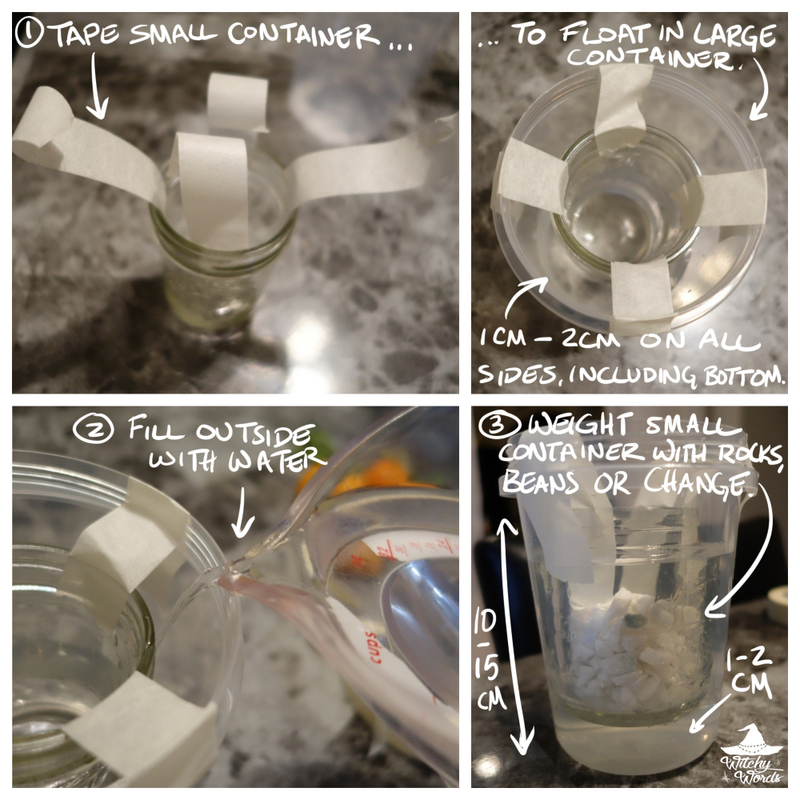 Small objects to help weight your smaller container from floating in the water, such as small rocks, beans, coins, etc. 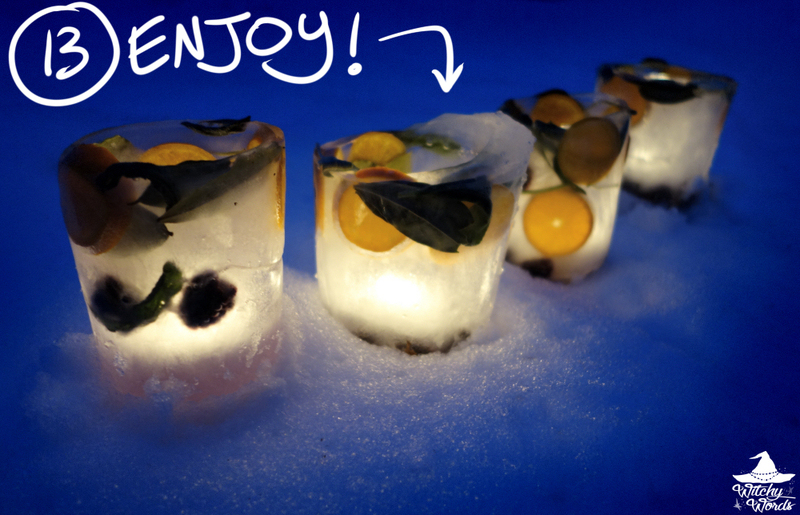 A tealight candle for your luminary. A kitchen lighter to light your luminary without burning yourself. Optional: A stick or end of a utensil to help position items in the water. Optional: A funnel to help direct your water. 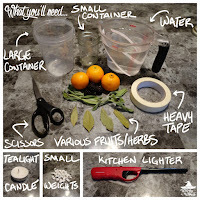 Begin by adding four long pieces of tape equidistant from each other inside your smaller container. 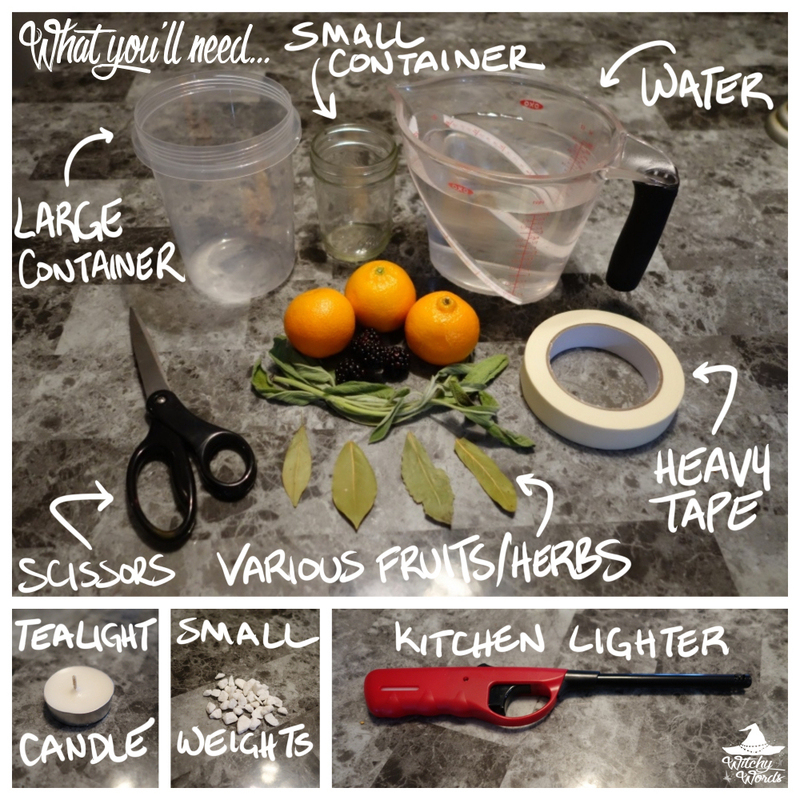 You'll want to place that smaller container about 1-2 centimeters away from all sides - right in the center of your larger container. You'll also want it about 1-2 centimeters from the bottom of your container. 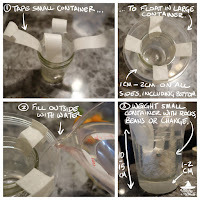 Once you have it positioned, attach the tape to the edge and outside of the larger container to make your smaller container "float" inside the larger one. Pour the water in the area between the smaller and larger container. 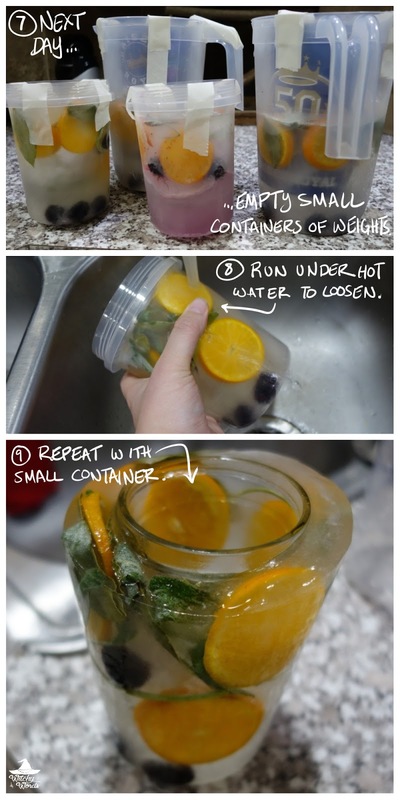 Be careful to avoid getting any water inside the smaller container as it will make it harder to thaw the next day. If you struggle with this, you may find a funnel is a helpful aid. You'll want the water to be pretty tall - about 10 centimeters or so. Keep the water below the lip of your inner container as this will make it a struggle to remove once frozen. Bonus tip: If you don't want a "frosted glass" look to your lantern, instead preferring clear, boil your water first! 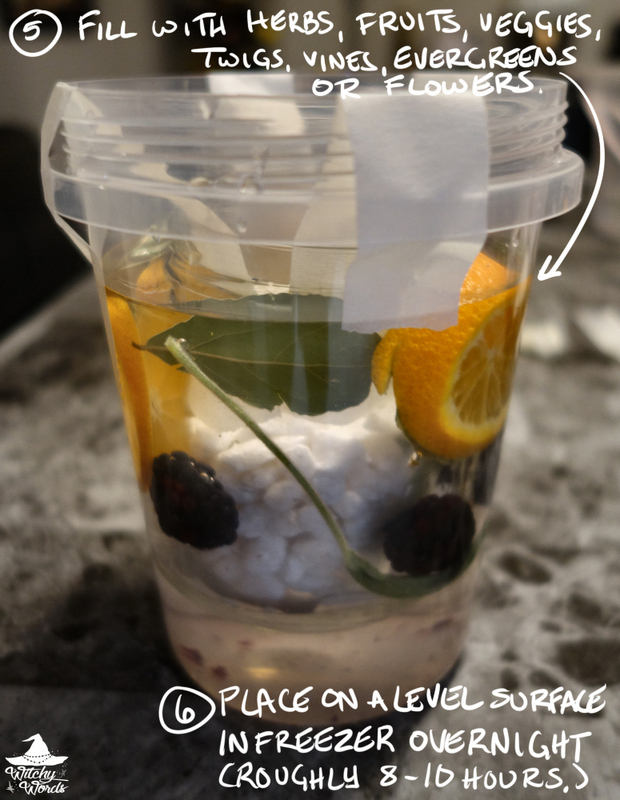 You'll then want to start adding your various fruits, herbs, twigs, and so forth. Having a stick, chopstick or back of a utensil like a fork or spoon may help you move the items around once in the water. Be sure to leave plenty of clear spaces where light can shine through. If you overload it, it will block the light of your candle. Bonus tip: Keep in mind the way physics will play a role in how your luminary will look: Some things will float and others will sink. You'll want a good mix of items that can do both, as well as some longer pieces that might be able to stretch the full length of the luminary. 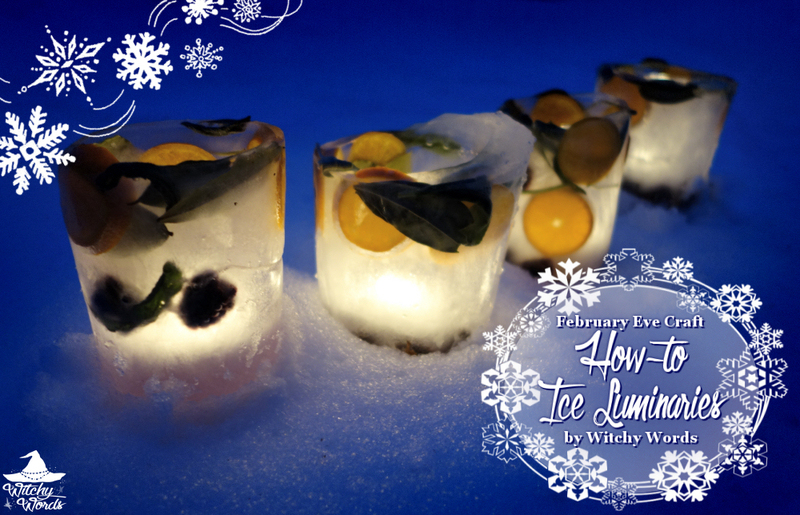 Once your satisfied with your luminary, place it inside your freezer on a level surface for at least 8-10 hours. I would strongly suggest prepping this on one day and finishing them on the next! Now that your lantern is frozen solid, it's time to release it! Begin by pouring out the weights you used to prevent the interior container from floating. 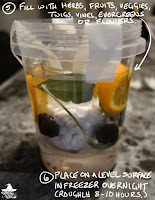 This should be easy to do if you didn't get any water in the interior container. Also, remove any tape as you'll no longer need it. Begin by pouring warm water over the outside container. Be careful not to get it inside the container as you don't want to melt your luminary in the process. Once the lantern is free of the exterior container, you'll want to fill the interior one with hot water and let it sit for a few seconds. If it starts to cool but the interior container isn't loose, dump it and fill it again with hot water. Once the interior container is loose, you should be able to pull it right out! Immediately take your luminary outside. 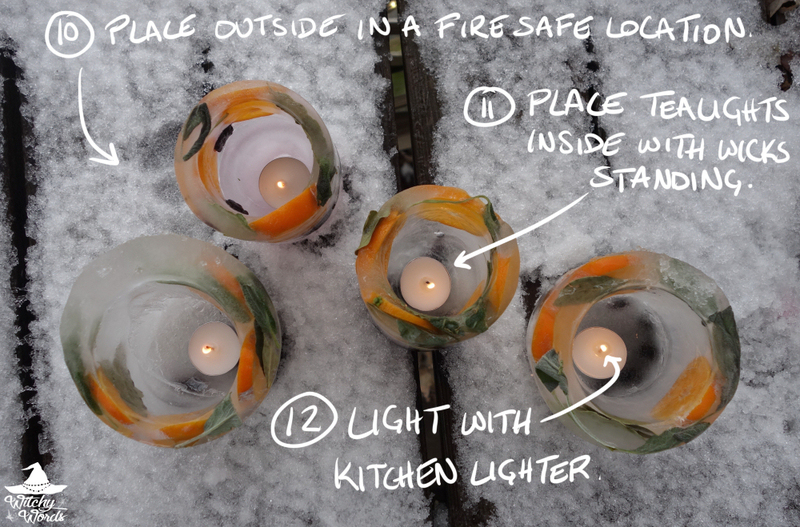 If the temperature is freezing or below, your lanterns should stay solid for quite some time! You'll now want to take your tealight candle and, making sure the wick is standing upright, place it inside your luminary. Using the kitchen lighter, light the candle. This may take some time thanks to the cold, surrounding ice and many other factors. 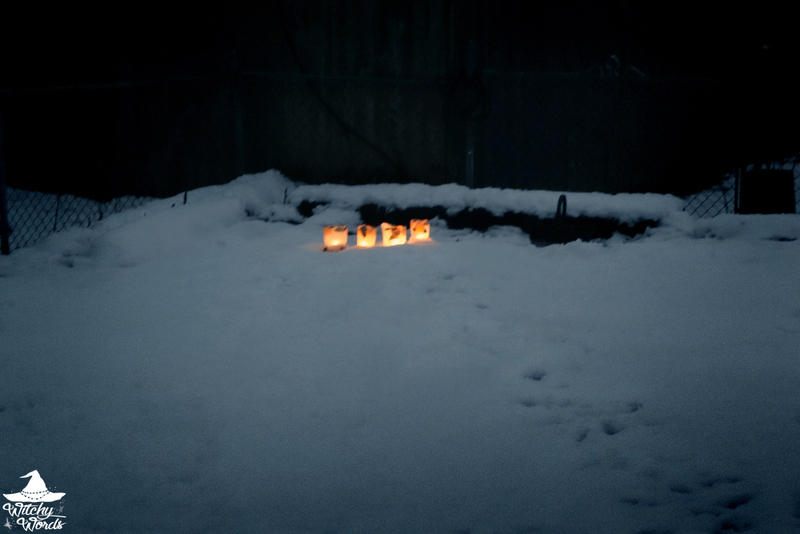 During the day, my luminaries were a bit dull. But, once the sun started to set, they looked spectacular! Overall, I was incredibly pleased with how these turned out! Though the process was a little more intensive than I had hoped as a spoonie, the end result was well worth it! Enjoy and have a blessed February Eve!